Background and objectives Rapid correction of severe hyponatremia can result in serious neurologic complications, including osmotic demyelination. Few data exist on incidence and risk factors of rapid correction or osmotic demyelination. Design, setting, participants, & measurements In a retrospective cohort of 1490 patients admitted with serum sodium <120 mEq/L to seven hospitals in the Geisinger Health System from 2001 to 2017, we examined the incidence and risk factors of rapid correction and osmotic demyelination. 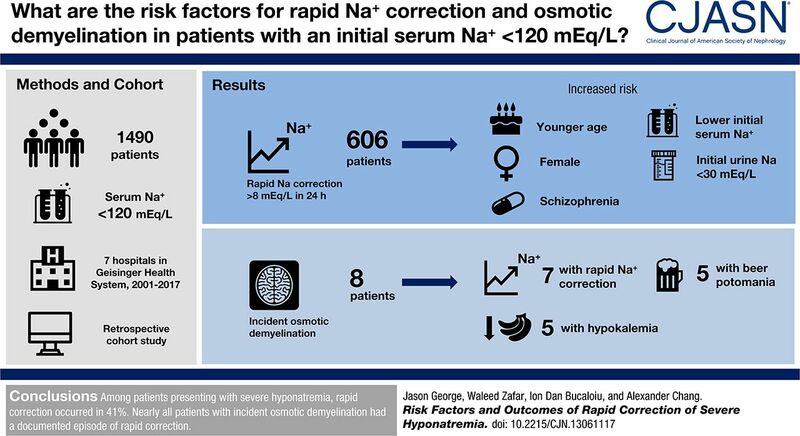 Rapid correction was defined as serum sodium increase of >8 mEq/L at 24 hours. Osmotic demyelination was determined by manual chart review of all available brain magnetic resonance imaging reports. Results Mean age was 66 years old (SD=15), 55% were women, and 67% had prior hyponatremia (last outpatient sodium <135 mEq/L). Median change in serum sodium at 24 hours was 6.8 mEq/L (interquartile range, 3.4–10.2), and 606 patients (41%) had rapid correction at 24 hours. Younger age, being a woman, schizophrenia, lower Charlson comorbidity index, lower presentation serum sodium, and urine sodium <30 mEq/L were associated with greater risk of rapid correction. Prior hyponatremia, outpatient aldosterone antagonist use, and treatment at an academic center were associated with lower risk of rapid correction. A total of 295 (20%) patients underwent brain magnetic resonance imaging on or after admission, with nine (0.6%) patients showing radiologic evidence of osmotic demyelination. Eight (0.5%) patients had incident osmotic demyelination, of whom five (63%) had beer potomania, five (63%) had hypokalemia, and seven (88%) had sodium increase >8 mEq/L over a 24-hour period before magnetic resonance imaging. Five patients with osmotic demyelination had apparent neurologic recovery. Conclusions Among patients presenting with severe hyponatremia, rapid correction occurred in 41%; nearly all patients with incident osmotic demyelination had a documented episode of rapid correction.